A major focus for the First Flight Foundation is working with the National Park Service to improve Wright Brothers National Memorial. The Foundation will build on the legacy of capital improvements and educational programming that was a fitting tribute to the 100th anniversary of the Wright brothers’ achievement. 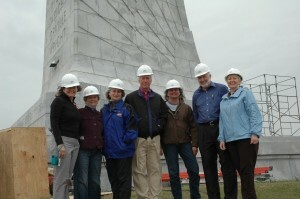 In 2008, the foundation completed a major restoration of the monument at Wright Brothers National Memorial, the first in more than a decade. Included in the project, costing over $400,000, was the cleaning of the interior and exterior of the monument, re-pointing the mortar; replacement of the electrical and mechanical systems, painting the stairs, reworking the dome and beacon, and design of a new night lighting scheme to enhance the magnificent architectural granite “wing” design. A ribbon cutting and celebration was held on June 25, 2008 to thank all of the partners who participated in the project. Funding for the restoration was provided by the foundation from monies raised during the First Flight Centennial Coin Match Program co-sponsored by the US Mint. Wright Brothers National Memorial is a magical place, with the sweep of Big Kill Devil Hill and the flat, open land where the Wright brothers made the first successful flight. Each year, over half a million visitors come to the site to experience this amazing story. Unfortunately, the facilities on site were simply inadequate. The old Visitor Center is too small, and the exhibits are dated. Park rangers provide wonderful personal interpretive talks for visitors, but seating is limited and excluded many visitors from this exceptional program. Educational programming for visiting school children has been developed, but was not able to be presented due to the limited facilities. To provide an outstanding visitor experience and a legacy for the Centennial Celebration at the site, the Foundation created the First Flight Centennial Pavilion. The Pavilion is a semi-permanent clearspan structure of about 20,000 square feet, which began serving visitors in May 2003. The Pavilion houses interpretive and educational exhibits, and provides a venue for speakers and other activities for celebratory events. The Pavilion celebrates the story of innovation and perseverance of that first flight as well as the magnificent impact of aviation in many forms during the first century. The Pavilion will continue for five years or more, as part of a long-term improvement plan for the park, serving at least 5 million visitors in total. Content partners include NASA, the United States Air Force, The Wright Experience, Outer Banks History Center, General Aviation Manufacturers Association (GAMA), U.S. Centennial of Flight Commission and others. Sponsored by Aircraft Owners and Pilots Association (AOPA), Outer Banks History Center, General Aviation Manufacturers Association (GAMA), U.S. Centennial of Flight Commission and others.